Sylvia English joined the Endofound marathon team right after her third endometriosis excision surgery in late February 2016. She’s running for every woman who has experienced endometriosis and every person who has stood by their side for support. Born and raised in New Zealand, Sylvia came to New York for graduate school (MS bioethics, Columbia University). She currently works as a project manager to advance precision understanding of endometriosis through novel technologies (like apps). She lives —and runs— in Brooklyn with her husband Matt, and their deaf and one-eyed dog Quinn. Check out Sylvia's fundraising page here! Sylvia: This is my first marathon ever! I’ve previously run a few half marathons. Sylvia: I like the thinking time and clarity running can bring. I also enjoy catching up on the podcast on my runs - ScienceFriday, 2 Dope Queens, and The Infinite Monkey Cage are some of my favorites at the moment. The hardest, but also the best, thing for me is the mental challenge of pushing yourself. 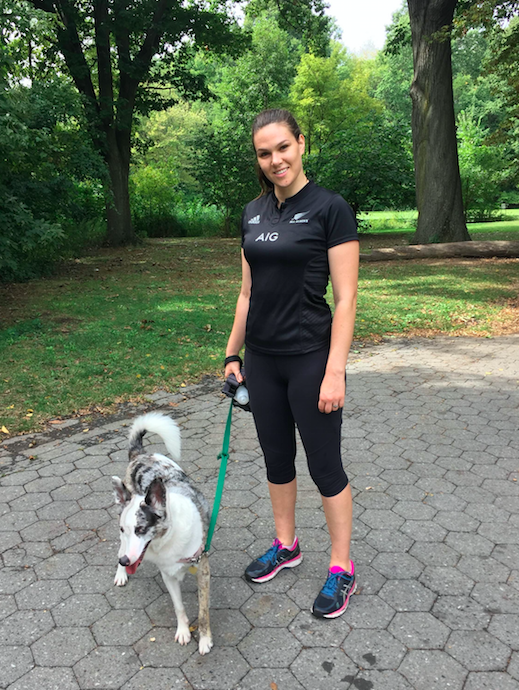 Sylvia: After my most recent surgery in February, I felt pretty determined to prove I can overcome the painful daily disruption of endometriosis by training for and running the NYC Marathon. Sylvia: Watching the on the ground impact of the ENPOWR Project. Seeing a classroom full of preteens learn about this disease makes me hopeful that with access to educational programs, other girls and women need not suffer the way I have. We need to make these kinds of programs widely available to adolescent and youth groups and raise awareness about the disease. Sylvia: Initially, I became involved in the Endofound first by speaking in classrooms around NYC through the ENPOWR Project, as a master's student several years ago. Today, I manage the Citizen Endo project at Columbia University, which aims to understand the patient experience of endometriosis through data science. We are working with endometriosis patients to build tools (like the Phendo app) to help describe and record their experience for both self-management and further research understanding. Sylvia: Sure. Like many others, my endometriosis was evident from my first period. My teenage years were often interrupted with a myriad of endometriosis symptoms, regularly dismissed by medical professionals or assigned to other pathologies. I had my first surgery in 2012 and my third this past February. I find that my personal experience underpins my professional motivation research endometriosis. Sylvia: Growing support for the Endofound is a part of increasing recognition of endometriosis as a serious and debilitating disease by the general public. Patients and their loved ones need a unified voice to be heard. Sylvia: All I'm going to be capable of doing is taking a shower and a nap, so my celebration will be a quiet moment of self-reflection on how I came to get over the finish line.